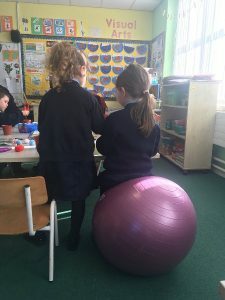 Junior and senior infants are trying out balance balls in their classrooms in the coming term instead of their usual chairs. There is one ball per table and the pupils sit on it for one hour each per day. 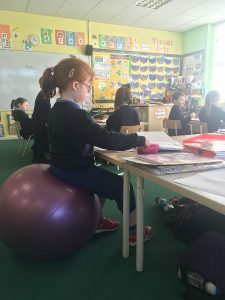 Studies have shown that use of the balls helps concentration levels, core strength of children and solves the need to fidget in seats.